During the past month, as more than 1,200 Sonoma County Library supporters signed the Sonoma Independent’s petition (on the right side of this page) urging our elected representatives to fund the reopening of library hours on Mondays, a list of six basic excuses from our Supervisors has emerged. In letters to concerned taxpayers and responses to reporters, our Supervisors, probably with the support of the County Administrator’s staff, have used six basic arguments for avoiding responsibility for allocating just $1.2 million from this year’s anticipated $13.5 million surplus to fund the restoration of Monday hours. It is understandable that citizens who express support for funding libraries feel powerless to press further when Supervisors respond with the arguments below. 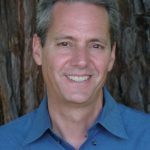 In keeping with the “Informing to Empower” mission of The Sonoma Independent, we debunk the arguments that are being provided to the public. And encourage readers to call their Supervisor at 565-2241, and urge them to take responsibility for restoring Monday hours this year. Excuse #1: Citizens Do Not Support More Funding for Libraries So Why Should Our Supervisors? Counter argument: Three times as many people voted for library tax than road tax. With 88,500 votes, last November’s Measure M tax to support libraries narrowly missed the challenging 2/3 majority that State law requires for earmarked new taxes. But this library measure received 88,500 votes, more than three times as many YES votes as Measure A for a road repair tax just did. It even received thousands more votes than Measure H, the far more costly bond issue for the Santa Rosa Junior College, which passed (because, inexplicably, bonds require only 55% approval). Libraries received nearly double the recent NO votes for Measure A. The percentage of No votes for measure A (62.7%) was less that the Yes votes for Measure M (63.3%). Yet pundits and Supervisors see that the recent defeat of Measure A as a voter mandate. Why, then, with three times as many votes, is Supervisor Gore and others unconvinced that citizens do not support funding libraries. Why, with twice as many votes as the Measure A “No” mandate, and a higher percentage of votes, can’t our Supervisors hear that taxpayers want to see our libraries reopened? Libraries are the only existing countywide program serving tens of thousands of citizens that was severely cut back during the recent recession and not restored. Monday closings have impacted the lives of more than 100,000 regular library users, most of them toddlers, children, and seniors. More than 1,200 citizens signed the Sonoma Independent’s petition urging Supervisors to spend just $1.2 million to restore Library hours. 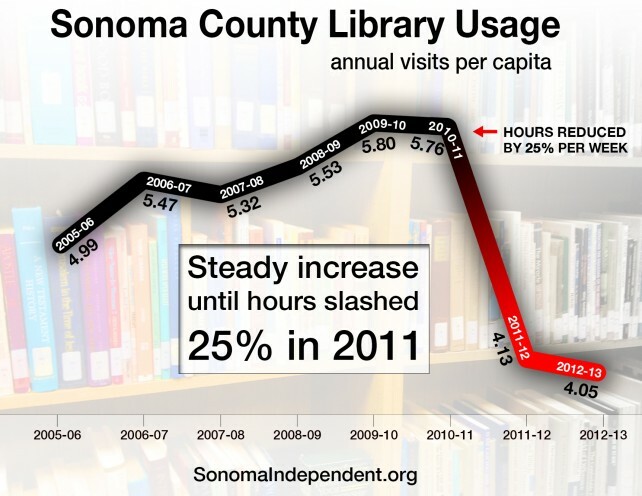 As reported in the Sonoma Independent, libraries had been open 70 hours per week in 1981 and are now open only 40 hours a week. Does this reflect the will of the public, or the unwillingness of our elected representatives to provide responsive government to taxpayers, and remedy the largest funding crisis in our County Library system’s history? Counter argument: Really? Restoring Monday hours is a priority for 100,0000 library users and about the only problem that the County has the funds to fully solve. Not a single one of the Board of Supervisor-prioritize needs is a County-provided public service that was cut back by 25% and has not been restored. Roads is also mentioned first by Supervisors in listing their priorities. But getting County roads up to par will cost hundreds of millions of dollars during the coming decade or two. During the past few years, Supervisors have added $8 million or so from the General Fund to augment the millions in dedicated funds already earmarked for roads through a state gasoline tax. Supervisors are likely to increase this$8 million contribution because a road tax failed. This road tax just received less than 1/3 the number of YES votes that November’s support library tax received. If Supervisors simply earmark about 10% less for road repair to give to libraries, it would make a difference to far more people than it would if that $1.2 million extra was added to roads. Or if $1.2 million less was added to the County’s $32 million rainy day reserve fund. Supervisors are also spending more than $1.2 million on new programs for that are typically funded through the state or federal government. One is a $600,000 marketing program for senior advocacy programs pushed by Supervisor Shirlee Zane to help seniors, who are heavy users of the library as their community center, feel more connected to their communities. Apparently, an investment in restoring a library system that has served our County for generations and will serve 40 times as many pre-schoolers as this allocation is not as important an investment to Supervisor Gore. This was a surprising statement,.According to the Press Democrat, since the recession budget of 2011, the County has restored 500 County positions and added 400 new jobs, at a cost to taxpayers of an additional $86 million per year. Libraries, during this period, have had no additional positions created, but cut dozens of part time positions. Counter-argument: It is a County system and Supervisors need to take responsibility for fixing the largest cutback in service that our County offers the public. Nobody suggests that our Board of Supervisors created the largest funding crisis in the history of Sonoma County’s Library system. But it is called the Sonoma County Library system for a reason. Regardless of governance legalities, it is, at its core, a County system. Just because it is structured to have an independent Board of Commissioners does not mean that those commissioners have the power, or the resources, to alleviate the structural funding problem–a problem that translates into half the funding per capita for our libraries as in Napa County. Our Supervisors, who are paid to oversee our tax revenue and fix challenging budgetary problems for County residents, have this power. And with a $13.5 million and funds earmarked for a rainy day reserve fund, they have both the funding, and the responsibility, to make this their job. Excuse #4: Due to the Internet, Libraries Are Not Used As Much or Are Not As Important As They Once Were. Counter-argument: Libraries are as popular as ever. They just need to be kept open. This argument is typically made by people who have not set foot in a Sonoma County library in a while, and there, have not seen the high level of activity there. The statistics in the graph at the top of this page show that in the seven years prior to cutting back library hours, while online research has grown, library usage, as demonstrated by the number of visitor trips to the library, had grown by hundreds of thousands of visits. Libraries are the quintessential public commons at the heart of our cities. For toddlers, children, teens, parents, grandparents, seniors, readers, and low income citizens needing to access media of all kinds, nothing has replaced the experience of visiting libraries. It was not until hours were cut back by 25% that library usage dropped. This demonstrates that tens of thousands of library users have been unable to adapt their schedules to visit the libraries more often. Both Supervisors Rabbit and Gore used the exact same wording in response emails about the libraries, indicating that they are relying upon County Administrator staff to crunch these numbers and come up with this argument. Counter-argument: These are County libraries that, like all government facilities, are located in the County’s cities. They are open to, used by, and valued by ALL County residents. This seems to be the most deceptive, and deflective excuse that Supervisors tell the public. There are only a few small libraries outside Sonoma County’s cities—so the 5% figure is basically those who use Guerneville’s library. But the figure is meaningless, as anyone using a library can attest, visitors to the City Library come from all over the County. For instance, while just 7,400 live in Sebastopol, its library is used by many of the 50,000 people who also use Sebastopol for commerce, dining and entertainment. Moreover, the implication that the library funding crisis is a problem that the cities ought to pay to fix is disingenuous. It ignores the reality that the Joint Powers Agreement governing the libraries makes it almost impossible for cities to contribute to an increase in library funding. Excuse #6: The Library Has Enough Money to Restore Hours If Its Commissioners Wanted To. Counter-argument: That is not enough money to reopen Mondays; real dollar spending has dropped, and the overall funding is woefully inadequate. Perhaps Supervisors can simply offer $700,000 to reopen libraries on Mondays this year, on the condition that the Library Commissioners match this with its $500,000 surplus. But try as our Supervisors may, there is no getting around the reality of the County’s library spending compared to the counties around us. 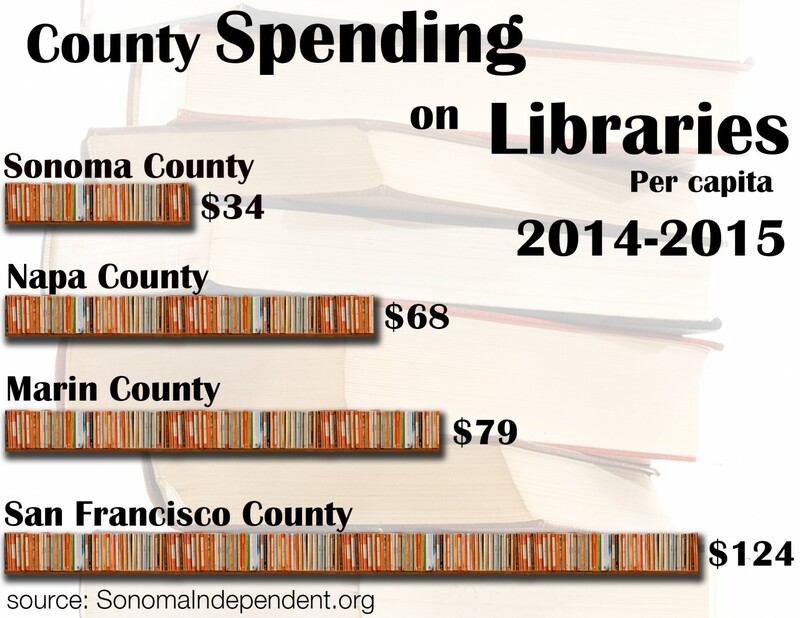 Sonoma County spends just $34 per capita on libraries, while Napa spends $68, Marin $79, and San Francisco $124. This is not a matter of Library Commissioners mismanaging their funding. And it is not because taxpayers in Sonoma County value libraries and education less than our Napa or Marin County neighbors. Sadly, it seems to be because our County Supervisors do.